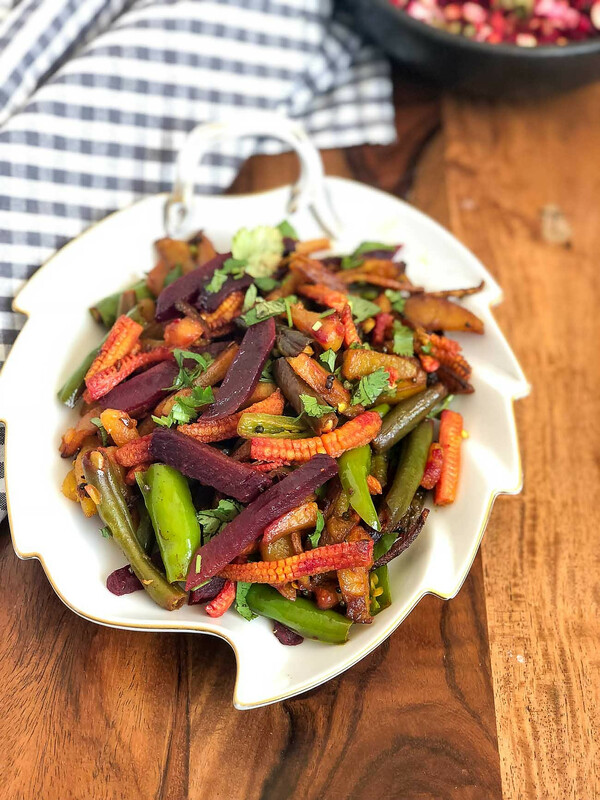 A healthy mixed vegetable North Indian Style Vegetarian Sabzi which you can have for lunch consisting of Aloo, Beetroot and Baby Corn pan roasted and tempered with mustard seeds in mustard oil. The delicious Aloo Beetroot and Baby Corn Mixed Sabzi Recipe is a North Indian Vegetarian sabzi which is a vegetable lovers paradise. 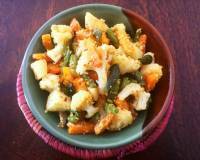 Loaded with fresh vegetables, tempered with mustard seeds and cooked in mustard oil. 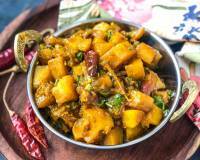 This North Indian dry sabzi can be served with dal and phulkas or used as a filling in wraps. 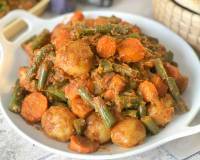 Ensure the vegetables are cooked just enough and are still crunchy. Bringing in variety in the choice of vegetables in your everyday diet and seasonal vegetables should be encouraged. This helps you get as many nutrients in your diet as possible. 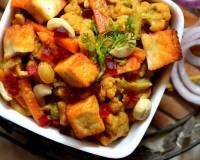 To begin making the Aloo, Beetroot and Baby Corn Mixed Sabzi Recipe, cut the vegetables into strips and set aside. 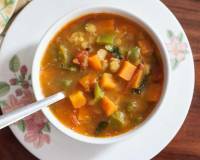 In a Pressure cooker, combine the beetroot, baby corn, carrot, and beans, add ¼ cup of water and pressure cook for 1 whistle, turn off the flame. Release the pressure immediately. In a pan, heat mustard oil on medium-high heat, add the mustard seeds and allow them to crackle. Add the garlic and ginger, saute for a few minutes until the garlic turns golden brown. Next add in the slit green chilies and raw potato strips, cover and continue to cook until the potatoes are soft. Occasionally, open the lid and give it a mix. Finally, add in the pressure cooked vegetables- beetroot, carrot, beans, baby corn and salt and turmeric. 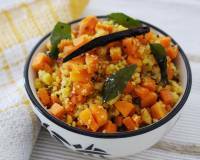 Give it a good stir and garnish with coriander leaves. 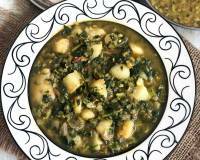 Serve Aloo, Beetroot and Baby Corn Mixed Sabzi hot .